The platform is so crowded that you fear you'll be pushed forward onto the tracks. You edge backwards slightly to forestall that possibility. Here comes a train now -- is it the Green Line? No, it's... the Black Line to Erebus? But there is no Black Line! And where the heck is Erebus? Wordplay. Much of the gameplay involves using homonyms of letters to spell words. Darkness. Although most locations are unlit, LOOK and EXAMINE still work much the same way as if everything was visible; one obvious exception is a book that cannot be read in the dark. There are 16 ways for the PC to die. The player can use UNDO after any of these deaths to continue playing. Under, In Erebus (Brian Rapp; 01-Oct-2010; Glulx). Beta-testers: Julie Lim, Marius Müller, Javri, Poster, Sorrel, Reina Adair, Matthew Alger, Isxek, Zhou Fang, Megan Park, and Ben Pennington. Cover art by Kate McDonnell (khatvanga.com), incorporating a background by Gustave Doré and a font by Douglas Vitkauskas. IF Comp 2010: 16th place of 26 entries. Download inerebus.gblorb from the IF Archive. The story file. Baf's Guide line wanted. (Please replace this line with a baf game template.). 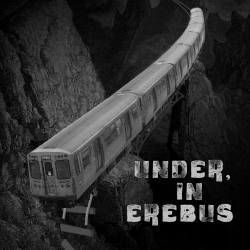 Under, In Erebus - at ifwizz interactive fiction (in German). Review (in Russian) by Valentine Kopteltsev. Review by Jacqueline A. Lott. This page was last modified on 21 June 2016, at 15:09.